The Alex Jones View – you don’t want to go there! Hey Hey Dr Q- Well well. Either it’s one of those serenpidetous (forgive spelling) coincidences or I had mentioned something about my plans to visit Peru and spend some time with the Shipibo shamans in the Amazonas, I’ve even been taking spanish lessons for the past few months in prep. now I don’t know if i mentioned that to you or it’s just sparked your interest -(thanks Alex Jones and the evil alien elves). It’s such a common assumption we westerners make – part of our reductionist/rational paradigm- take something from nature and/or traditional cultures, break it down to it’s individual components- eg isolate a chemical compound, refine it and take it in doses that are virtually guaranteed to fry your brain and bring on psychotic paranoia and preferably do it in the most innapropriate context like at a ‘rave’ or driving a car…then people wonder why evil alien elves have taken up residence in their wardrobe. Consequently the ‘law’ criminalises it to protect…etc and so on. Like so many medicinal compounds used and held sacred by indigenous people the world over, from ganja to magic mushies, peyote and so on …they are meant to be used as a ‘sacrament’ and a sacred initiation into the deeper mysteries. Ayahusca particularly (so I’ve come to believe) known as “spirit vine or “vine of the soul” has the power to unlock parts of the psyche not normally accessible in our ‘every day’ awareness so as to facilitate a glimpse ‘behind the veil’ of illusion and subjective reality…in so doing, bring about a permanent transformation in individual consciousness based on direct experience. One of it’s primary uses is as a healer- and it has been used in this way under the guidance of a “currandero” (healer) in the Amazonas cultures -to bring about healing of physical/psychological/emotional illness. The point I’m making I guess is that it should be experienced in a ‘holistic’ ‘whole-istic’ context, not as some chemical derivative. I havn’t tried ayahuasca ..but I look forward to getting over to Peru (in April/May) and I’ll share my experiences and insights via Dr Q’s blog (for anyone interested). and a short doco you might enjoy..
ps great vids and loved the article. Claude-Paul, you make some very important points. 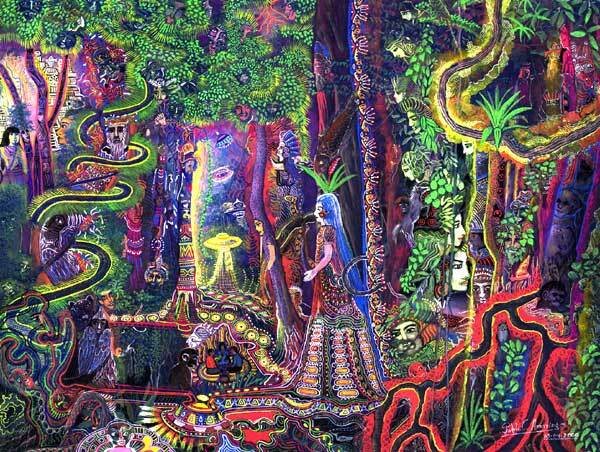 Yes we must set the record straight for people who are contemplating using DMT or Ayahuasca. These things are not party drugs. Recreational drug use can be and often is deadly or very destructive. I use the term Deep Resonance Ecology in the article above. Surely it is time for human beings to start reconnecting a deep and resonating level with the life of this planet. Every bit as amazing as depicted in the movie Avatar and truly so even more amazing than that . . .if we have the eyes to see the ears to hear. Blessings be.